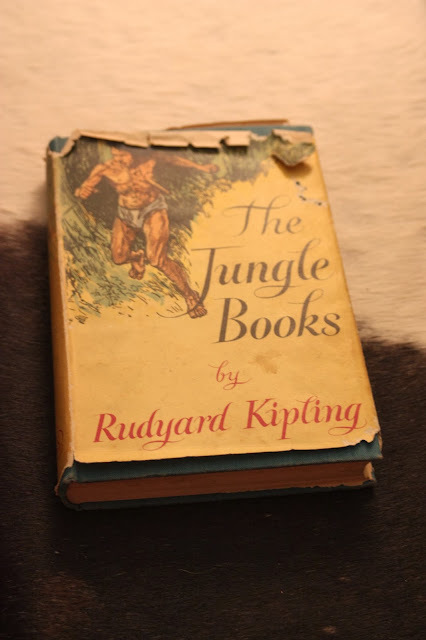 Today is Rudyard Kipling's birthday. How better to remember him than reading one of my favorite stories about that one of a kind mongoose, Riki Tiki Tavi. He spent all that day roaming over the house. He nearly drowned himself in the bath-tubs, put his nose into the ink on a writing table, and burnt it on the end of the big man's cigar, for he climbed up in the big man's lap to see how writing was done. At nightfall he ran into Teddy's nursery to watch how kerosene-lamps were lighted, and when Teddy went to bed Rikki-tikki climbed up too; but he was a restless companion, because he had to get up and attend to every noise all through the night, and find out what made it. Teddy's mother and father came in, the last thing, to look at their boy, and Rikki-tikki was awake on the pillow. Then Rikki-tikki went out into the garden to see what was to be seen. It was a large garden, only half cultivated, with bushes as big as summer-houses of Marshal Niel roses, lime and orange trees, clumps of bamboos, and thickets of high grass. Rikki-tikki licked his lips. ``This is a splendid hunting-ground,'' he said, and his tail grew bottle-brushy at the thought of it, and he scuttled up and down the garden, snuffing here and there till he heard very sorrowful voices in a thorn-bush. ``Wicked, wicked Darzee!'' said Nag, lashing up as high as he could reach toward the nest in the thornbush; but Darzee had built it out of reach of snakes, and it only swayed to and fro. He went away for a dust-bath under the castor-oil bushes, while Teddy's father beat the dead Karait. ``What is the use of that?'' thought Rikki-tikki. ``I have settled it all''; and then Teddy's mother picked him up from the dust and hugged him, crying that he had saved Teddy from death, and Teddy's father said that he was a providence, and Teddy looked on with big scared eyes. Rikki-tikki was rather amused at all the fuss, which, of course, he did not understand. Teddy's mother might just as well have petted Teddy for playing in the dust. Rikki was thoroughly enjoying himself. ``Do you think a snake-killer kills musk-rats?'' said Rikki-tikki scornfully. ``My cousin Chua, the rat, told me --'' said Chuchundra, and then he stopped. ``Everything. When there were no people in the bungalow, did we have any mongoose in the garden? ``Now, if I kill him here, Nagaina will know; and if I fight him on the open floor, the odds are in his favour. What am I to do?'' said Rikki-tikki-tavi. There was no answer from outside, so Rikki-tikki knew Nagaina had gone away. Nag coiled himself down, coil by coil, round the bulge at the bottom of the water-jar, and Rikki-tikki stayed still as death. After an hour he began to move, muscle by muscle, toward the jar. Nag was asleep, and Rikki-tikki looked at his big back, wondering which would be the best place for a good hold. ``If I don't break his back at the first jump,'' said Rikki, ``he can still fight; and if he fights -- O Rikki!'' He looked at the thickness of the neck below the hood, but that was too much for him; and a bite near the tail would only make Nag savage. Rikki-tikki held on with his eyes shut, for now he was quite sure he was dead; but the head did not move, and the big man picked him up and said: ``It's the mongoose again, Alice; the little chap has saved our lives now.'' Then Teddy's mother came in with a very white face, and saw what was left of Nag, and Rikki-tikki dragged himself to Teddy's bedroom and spent half the rest of the night shaking himself tenderly to find out whether he was really broken into forty pieces, as he fancied. When morning came he was very stiff, but well pleased with his doings. ``Now I have Nagaina to settle with, and she will be worse than five Nags, and there's no knowing when the eggs she spoke of will hatch. Goodness! I must go and see Darzee,'' he said. ``All that's true enough; but where's Nagaina?'' said Rikki-tikki, looking carefully round him. ``Nagaina came to the bath-room sluice and called for Nag,'' Darzee went on; ``and Nag came out on the end of a stick -- the sweeper picked him up on the end of a stick and threw him upon the rubbish-heap. Let us sing about the great, the red-eyed Rikki-tikki!'' and Darzee filled his throat and sang. She fluttered in front of Nagaina by the rubbish heap, and cried out, ``Oh, my wing is broken! The boy in the house threw a stone at me and broke it.'' Then she fluttered more desparately than ever. ``All in good time,'' said she, without moving her eyes. ``I will settle my account with you presently. Nagaina saw that she had lost her chance of killing Teddy, and the egg lay between Rikki-tikki's paws. ``Give me the egg, Rikki-tikki. Give me the last of my eggs, and I will go away and never come back,'' she said, lowering her hood. And the red ants that live between the grass stems heard him, and began to troop down one after another to see if he had spoken the truth. The Coppersmith is a bird who makes a noise exactly like the beating of a little hammer on a copper pot; and the reason he is always making it is because he is the town-crier to every Indian garden, and tells all the news to everybody who cares to listen. As Rikki-tikki went up the path, he heard his ``attention'' notes like a tiny dinner-gong; and then the steady ``Ding-dong-tock! Nag is dead -- dong!Nagaina is dead! Ding-dong-tock!'' That set all the birds in the garden singing, and frogs croaking; for Nag and Nagaina used to eat frogs as well as little birds. Wow, what a flashback. I remember Rikki-tiki-tavi from my childhood. I forgot all about Rikki-tikki until this. Cool.